Front Range Preventive Imaging (FRPI) employs only extensively validated and FDA approved technology, with the most advanced software for each service. That is why we have invested in Electron Beam Tomography, the undisputed Gold Standard in noninvasive coronary imaging. People should be aware of the trend to use higher radiation spiral or helical CT scanners when imaging the heart. These scanners typically have 3 times the radiation exposure and 1/3 the accuracy of an EBT scanner. Doctors associated with FRPI have been practicing in Colorado for many years and remain committed to offering gold standard technology that is FDA approved for its clinical uses. Front Range Preventive Imaging uses Electron Beam Tomography (EBT), the only extensively proven technology able to perform accurate coronary artery imaging and quantify coronary calcium. “Spiral or Helical CT” scanners are also used for calcium imaging. Spiral scanners cannot acquire images fast enough to prevent blurring due to the cardiac motion that occurs continuously. Studies have proven that spiral/helical scanners frequently mischaracterize patients as scores generated by these scanners are not necessarily accurate. In addition, the radiation dosage from such scanners is at least 3X higher than EBT, often more depending on the protocol being used. The EBT scanner is FDA approved and was developed as a cardiac imaging tool in the early 1980’s. It is available worldwide at leading preventive heart centers like the Mayo Clinic, Cleveland Clinic, and UCLA. EBT is considered the “gold standard” in coronary calcium imaging. There are hundreds of articles in the cardiology literature discussing EBT. The coronary calcium score measured by EBT has been proven to be a powerful predictor of future coronary events and has been shown to be able to monitor the progression, stabilization or reversal of atherosclerosis. No similar proof of accuracy occurs with any other type of scanner. 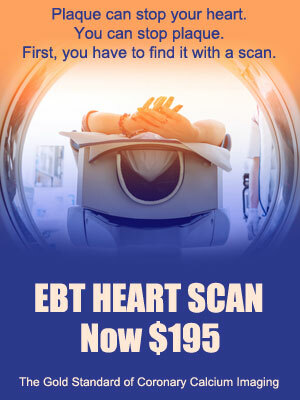 Whenever possible, get a coronary scan from an EBT machine. If that is not possible, know that any heart scan is better than no heart scan at all. It is especially important that your previous scan by EBT is not followed by a scan from another technology. No physician will be able to interpret the score differences between two scans from two different scanners. To interpret rate of disease progression or improvement you will need 12 months between scans done on an EBT scanner and 4-5 years between scans done on 64 slice helical scanners. If you are concerned about radiation dosage, EBT has the lowest radiation exposure. It is 0.7 mSv, which is the same as the exposure for a mammogram.